Consider adding this to your order for a pair of boots. No extra shipping charge when included with boot purchase. This beeswax treatment is known for its superior ability to waterproof and preserve leather. It is specially formulated to condition and restore oil-tanned work boots and sports gear while retaining superior breathe-ability. This product contains no animal fats or solvents that can damage leather. 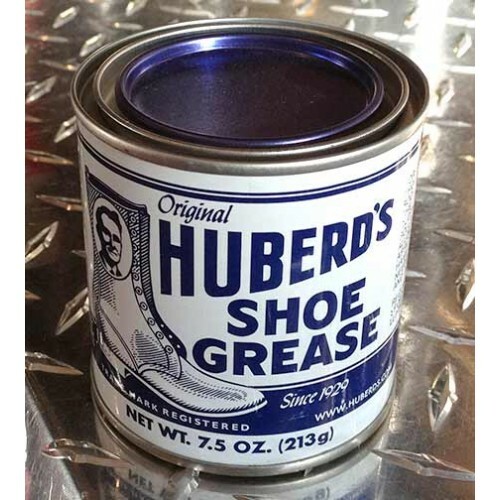 Huberd's time-tested compound remains apart in its unique effectiveness to renew leather and extend the comfort and life of boots, shoes and all fine oil tanned leather. Recommended for heavy work and sport footwear and leather goods. May darken certain leathers. Should not be used on suede. Instructions for Use: Before treating, thoroughly clean leather and warm to room temperature. Rub grease into the leather with hands or a soft cloth. Carefully grease where soles join uppers and all stitching. Allow to penetrate the leather then apply another coat. After shoes have treated once, apply as needed to maintain waterproofing and conditioning of leather.